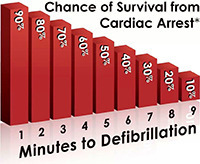 National Set Medics can provide up to 90% chance of survival for cardiac emergencies compared to only 40% by calling 911 alone! The Dallas City Fire Department has a great average response time of 6:11*. How long would it take to call 911 and have an ambulance arrive to your location? National Event Medics gives your guest and vendors precious life-saving minutes by being right there, right now! But it’s not just heart attacks. Texas Event Medics is the best on-location means to recognize a medical emergency, stabilize your patient and if necessary, arrange transportation to definitive care.